Win A Day Casino has been around since 2008, and they have a fairly unusual – although still legitimate license – in the online casino world, which is issued out of the Comoros Islands. Win A Day Casino has only recently started offering mobile casino gaming alongside their instant play site, which is largely powered by Slotland Entertainment. Expect to find a wealth of games which you would not ordinarily find in the online casino world at this English language casino domain. 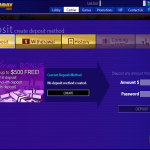 Win A Day Casino’s payment methods include bank draft, cheques, MasterCard, Neteller, Skrill, VISA, and wire transfers, with players able to use the US dollar to deposit into their accounts, play games, and withdraw winnings. Customer support is available via live chat and e-mail if you should require it. 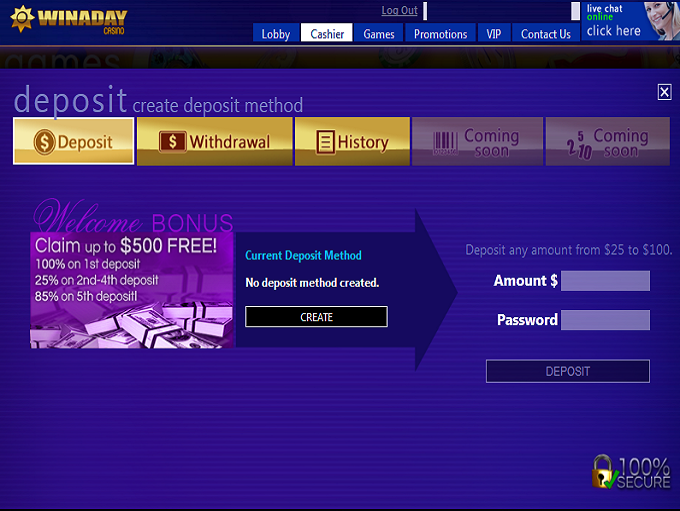 Any player that makes a deposit at Win A Day Casino can claim a 100% match deposit bonus on the very first deposit they make via mobile or desktop devices, as well as pocket an extra $16 on the house. On Wednesdays, players can claim 80% match deposit bonuses on their deposits, whilst tournaments also form a pretty impressive array of promo offers at Win A Day. 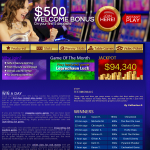 If you’re after something a little more bonus like, then you should try your hand at their high-roller welcome bonus (which is worth up to $500), their instant cash back deals for $500 a month, a daily prize draw for all players which takes place every day, and a Game of the Month deal which can see players gifted another opportunity to pocket $500 in cash. 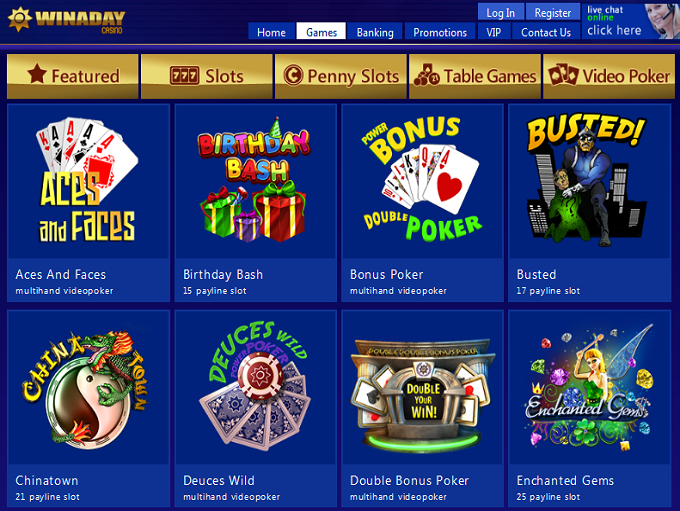 The Games at Win A Day Casino are all provided by Slotland Entertainment, as we’ve mentioned. The chances are, then, that you won’t have seen many of them before. 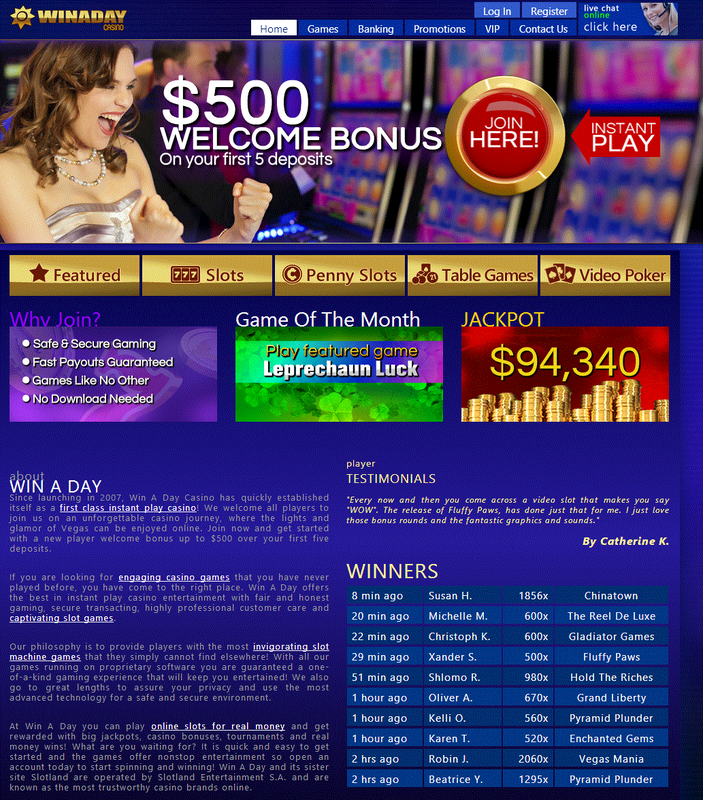 Gaming genres include featured titles, slots, penny slots, table games, and video poker titles. As well as their basic slot machine games, the casino also houses keno, roulette, and special table games which form the basis for their many tournaments, which take place every day, every week, and every month. Win A Day Casino’s slots are certainly original. Some of the larger titles include games like Alice in Wonderland, Beauty Salon, Castle Siege, Deep Blue, Enchanted Gems, Fruits and Bars, Full Bloom, Joker’s tricks, Lost World, Pyramid Plunder, Robot Escape, Sam’s Burger, Tropical Treat, Vikings, Wedding Bells and Wild Alaska, as well as their biggest recent hit, the Zodiac slot machine. The following countries are restricted at this casino: Belarus, China, Czech Republic, Indonesia, India, Kazakhstan, Lithuania, Latvia, Malaysia, Slovakia (Slovak Republic), Turkey, Ukraine, Vietnam.